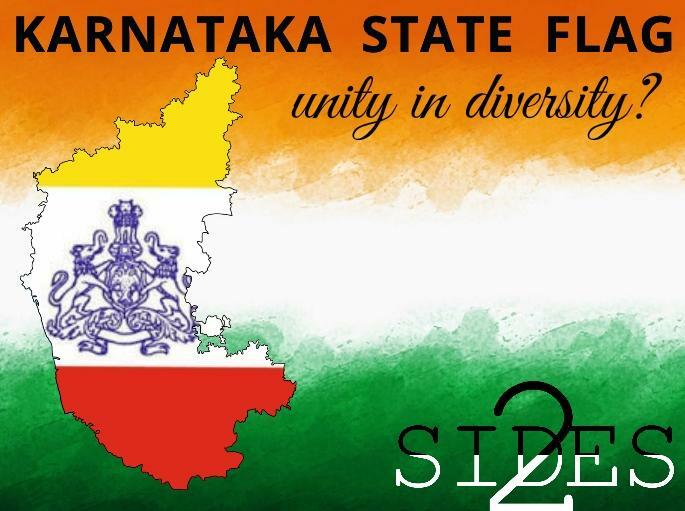 Karnataka State Flag - Unity in Diversity? HomeSouth IndiaKarnataka State Flag - Unity in Diversity? The constitution does not specifically mention anything with regards to states having separate flags. So far, only Jammu & Kashmir had an official flag of its own beside the national flag due its special status accorded by Article 370. The Karnataka state flag, announced by the Congress government in Karnataka and sent to the Union government for approval, is a tricolour in red, white and yellow with the Karnataka state emblem at the centre. The government had constituted a 9 member committee last year to study the design and legal sanctity of a state flag and the decision has been taken based on its recommendations. The official announcement has to be made by the central government. The Congress government in Karnataka has been accused of playing 'divisive politics' with an eye on the upcoming state elections. Karnataka goes to polls this year in April-May and is one of the four remaining states where the Congress is still in power. Shobha Karandlaje, BJP MP from Udupi-Chikmagalur constituency, has accused the state government of "going against the nation” with the adoption of the state flag and other such measures meant to appropriate Kannada pride and self-respect. For instance, the government decision last year to remove Hindi signboards from the Namma Metro in Bengaluru following the "Hindi Beda" agitations had courted controversy. Opposition political parties, including BJP and Shiv Sena, have been critical of these measures seen as the Congress trying appeasement measures to consolidate the votes of the local population. The Indian National Flag, the cherished tricolour, was adopted in 1947 by the Constituent Assembly and was designed to be inclusive of every Indian, irrespective of his caste, creed, colour, gender or locality. The national flag crystalises the emotions of patriotism and national identity, symbolises our shared history and is a beacon for the future. By declaring a separate state flag, Karnataka is nothing short of undermining India's unity and integrity by emphasising regional identity more than the national identity. This would definitely be dangerous to harmonious growth and relations between state and centre in the long run. The constitution does not profess nor prohibit state flags in India, but the basic tenet of India's unity in diversity should not be overshadowed for short-term political goals. A responsible state leader would have considered these facts, and his or her duty to safeguard and adhere to India's quasi-federal structure, before giving in to the demands of divisive elements. The Congress, however, has once again failed the nation at large. There are around 30 federal countries in the world today accounting for 40% of the population, and most of them, including the United States, allows regional flags for the states. Regional flags will, in fact, help bolster India's unity in diversity. Recognising the diversity of the country, which would be what a state flag would symbolise, will make the national identity stronger rather than weaker. Karnataka has a strong sub-nationalism as well as regional identity - it has its own official state song; a red and yellow flag has been the unofficial flag of the state since the mid-1960s when it was created by Kannada writer and activist Ma Ramamurthy. This unofficial flag is used very widely and is part of the Kannada psyche and is often hoisted across the state on November 1, the date the state was formed. The governments move to adopt the flag as the state flag is only a legal and logical extension to the situation on the ground in the state. The new flag, called the "Naada Dwaja", has white symbolising peace, yellow symbolising auspiciousness and well-being of Kannadigas, and red colour symbolises courage. The Ganda Bherunda, a mythical beast found on the state emblem(which is also present on the flag), was first seen in coins of the Vijayanagara Empire as early as 1510 and is a symbol of the Mysore dynasty. Thus, in a time when Hindutva forces attempt to repaint Indian history in huge splashes of saffron as an era of Mughal oppression, the Karnataka flag helps reclaim and remember the glorious and rich history and culture of the region. In the landmark S.R. Bommai v/s Union of India (Supreme Court 1994) case, the Supreme Court declared that there is no prohibition in the Constitution for the state to have its own flag. However, the manner in which the state flag is hoisted should not dishonour the national flag. It has to be always below the national flag. Karnataka chief minister Siddaramaiah reaffirmed this fact when he said that the state flag will be flown below the national flag. Thus there exist no legal hurdles for the adoption of the state flag by Karnataka. The only stumbling block will be the political one, of having to get the approval of the central BJP government. In 2012, when BJP was in power in Karnataka, then minister DV Sadananda Gowda had virtually given the red and yellow Karnataka flag official status by making it compulsory to hoist the state flag on government buildings, schools and colleges. This notification was, however, later withdrawn following a court order. A Karnataka state flag will go against the Hindu nationalistic ideology which forms a major part of the BJP philosophy as well as its election strategy. Syama Prasad Mookerjee, the founder of Bharatiya Janata Sangh, a prominent precursor to the BJP, had famously proclaimed: ek vidhan, ek pradhan, ek nishan (one constitution, one prime minister, one flag). Thus it is only natural for the BJP to oppose this move by the Congress government and try to label it as anti-national. It is merely trying to sweep a legitimate issue of the populace of a state under the carpet to further its own political end goals.